Bamboo growth involves the production of new shoots every year in the spring that go on to grow into bamboo culms (canes). For a couple of months from when you first see the shoots appearing from the soil the culms will be growing in height and diameter along with producing branches and leaves. Once the culms have finished growing during this time, they will not grow any higher or wider. That's the growth finished for that culm apart from growing new foliage annually over an approximate ten year life span for the average culm, up to fifteen years in some cases. Being a grass, bamboos grow new plants from the original parent, or existing, bamboo plant. It will use the energy provided by the parent plant to produce new ones and colonise an area over time. Remember this colonisation with new shoots, culms, and plants, is different for clumping bamboo and running bamboo species though. Clumping bamboo tends to grow into a larger diameter clump and is more controllable, whereas running bamboo sends out rhizomes that can have shoots some distance from the original plant. It is therefore important when planting running bamboo types that some artificial way of controlling it is implemented in the form of a barrier if you do not want it to spread wherever it pleases. Alternatively, you can limit the direction of rhizome growth with barriers so that it spreads in a line. A new bamboo will take approximately three years to establish but can take upwards of four years to achieve the maximum size of culms, dependent on the species, climatic conditions, soil, sun, water, and health, all of which play a big part in bamboo growth as with any other plant. Just because bamboo is known to grow fast, don't expect to by a juvenile bamboo and it will be fully grown the following year, it takes longer than that to get a mature bamboo in all its glory. Following planting bamboo, each year the shoots and culms will get bigger in height and diameter until the mature plant size is reached, if it is provided with the correct conditions for the species. It is quite a thrill when the bamboo is established and first starts sending up big shoots that grow at a fast rate into the beautiful culms you expect from the species you have chosen. Every day you can see a difference in the growth and this is just one of the things, out of many, that are so appealing about growing bamboo plants. When you buy a new bamboo plant, be aware that the culms you can see have already finished growing. The only exception is where the bamboo has recent shoots such as those that emerged less than two months previously; these may not have quite finished growing yet. Rhizomes are really the most important aspect of the plant because although you can see canes above ground, it is healthy rhizomes that will determine successful bamboo growth into shoots and culms. If you can imagine that instead of one plant you will eventually have a whole group of plants, you may go some way to understanding how bamboo grows underground and ultimately above ground. The rhizomes, that pretty much look like underground culm canes in structure with both nodes and internodes, will be getting energy and storing nutrients which will then be converted into producing shoots and culms, if the rhizomes are healthy. A mature and larger plant will be achieved through the ability of the rhizomes to store the nutrients required to produce this above ground group, or grove, of plants. New rhizomes and roots grow from the rhizome nodes underground so you can imagine it is important that your bamboo rhizomes stay healthy. As the grove of plants gets more mature you will see the smallest and oldest culms dying off, on average at around ten years for an individual culm, and the newest youngest culms showing their mature height, diameter, and colour. New bamboo shoots are delicate and easily damaged. If you plant your bamboo in open ground, be extremely wary of where you are treading when walking around the plant and/or clearing weeds from between culms. You could easily damage a new shoot that is about to appear out of the soil by accidentally treading on it, kicking it over, or pulling the tip off while weeding. Once the shoots start growing they do grow very quickly and are then visible enough to avoid damaging, but until then you should be careful. A shoot will emerge at a diameter that will be the culm width once grown. Yet another fascinating thing about bamboo growth is that each year you get to see wider shoots emerging until they reach the mature culm width. The individual culm will not get any wider in following years. The way the culm grows from the shoot can best be described as telescopic, it grows out in a similar way to how telescopes extend. The culm will grow its height first followed by branching and unfolding of leaves. Initially in immature bamboo growth, the culms may not appear as expected but as your bamboo matures over the years you should see a change in the culm colour and structure and it will look more like the bamboo species you thought you were buying, more like its parent plant! This means that you should not worry if you purchased a young bamboo that should have striped culms, or leaves, of a particular colour, and it looks different to what was expected. Over the years the culms will mature to how they should be... provided the bamboo was labelled correctly! So... each new lot of spring bamboo growth over the years will generally see new culms that have more width and height that the year before but only until the full maturity of the bamboo species has been reached, again dependent on the conditions and plant health. Once maturity is achieved, you will notice the older culms looking small in comparison. 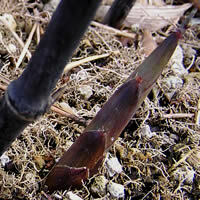 The reason culms are able to get larger year on year is down to the rhizome system and its maturity and health. 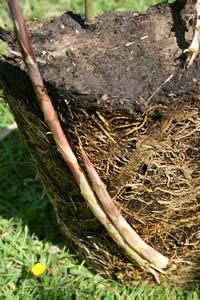 If the rhizome system is getting nutrients and growing as it should, the culms will get larger each year. 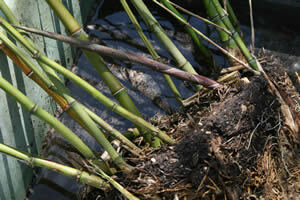 As the rhizome system matures, so will your bamboo growth. Larger bamboo species tend to prefer a lot more sunlight hours per day to achieve maximum potential, over twenty feet high. The smaller species on the other hand tend to prefer a position that gets some partial shade through part of the day, particularly in regions with strong sunlight. Because bamboo growth rate is so fast, and running bamboo species spread, unless you want to eventually have a big grove of plants you will need some method of control over the growth of your bamboo. The best way to do this is to ensure you pick the correct species first. If you don't want a runner choose clumping species, if you want bamboo to spread rapidly through an area choose a running species. See Bamboo Control and Bamboo Barrier for more information about control and barriers. A young plant has to become established and mature before you will see its maximum size, culm diameter, and height. Success is dependent on rhizome maturity, health, nutrients, sunlight, moisture, etc. When planting out new divisions of bamboo, be patient and give the plant time to recover and get established in its new location.